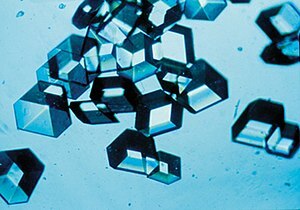 Single crystalline form of solid insulin. Solid is one of the four fundamental states of matter (the others being liquid, gas, and plasma). In solids particles are closely packed. It is characterized by structural rigidity and resistance to changes of shape or volume. Unlike liquid, a solid object does not flow to take on the shape of its container, nor does it expand to fill the entire volume available to it like a gas does. The atoms in a solid are tightly bound to each other, either in a regular geometric lattice (crystalline solids, which include metals and ordinary ice) or irregularly (an amorphous solid such as common window glass). 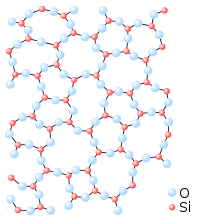 Solids cannot be compressed with little pressure whereas gases can be compressed with little pressure because in gases molecules are loosely packed. Model of closely packed atoms within a crystalline solid. The atoms, molecules or ions that make up solids may be arranged in an orderly repeating pattern, or irregularly. Materials whose constituents are arranged in a regular pattern are known as crystals. In some cases, the regular ordering can continue unbroken over a large scale, for example diamonds, where each diamond is a single crystal. Solid objects that are large enough to see and handle are rarely composed of a single crystal, but instead are made of a large number of single crystals, known as crystallites, whose size can vary from a few nanometers to several meters. Such materials are called polycrystalline. Almost all common metals, and many ceramics, are polycrystalline. Whether a solid is crystalline or amorphous depends on the material involved, and the conditions in which it was formed. Solids that are formed by slow cooling will tend to be crystalline, while solids that are frozen rapidly are more likely to be amorphous. Likewise, the specific crystal structure adopted by a crystalline solid depends on the material involved and on how it was formed. The pinnacle of New York's Chrysler Building, the world's tallest steel-supported brick building, is clad with stainless steel. People have been using metals for a variety of purposes since prehistoric times. The strength and reliability of metals has led to their widespread use in construction of buildings and other structures, as well as in most vehicles, many appliances and tools, pipes, road signs and railroad tracks. Iron and aluminium are the two most commonly used structural metals. They are also the most abundant metals in the Earth's crust. Iron is most commonly used in the form of an alloy, steel, which contains up to 2.1% carbon, making it much harder than pure iron. A collection of various minerals. Most ceramic materials, such as alumina and its compounds, are formed from fine powders, yielding a fine grained polycrystalline microstructure that is filled with light-scattering centers comparable to the wavelength of visible light. Thus, they are generally opaque materials, as opposed to transparent materials. Recent nanoscale (e.g. sol-gel) technology has, however, made possible the production of polycrystalline transparent ceramics such as transparent alumina and alumina compounds for such applications as high-power lasers. Advanced ceramics are also used in the medicine, electrical and electronics industries. Mechanically speaking, ceramic materials are brittle, hard, strong in compression and weak in shearing and tension. Brittle materials may exhibit significant tensile strength by supporting a static load. Toughness indicates how much energy a material can absorb before mechanical failure, while fracture toughness (denoted KIc ) describes the ability of a material with inherent microstructural flaws to resist fracture via crack growth and propagation. If a material has a large value of fracture toughness, the basic principles of fracture mechanics suggest that it will most likely undergo ductile fracture. Brittle fracture is very characteristic of most ceramic and glass-ceramic materials that typically exhibit low (and inconsistent) values of KIc. As another example of ceramic applications, in the early 1980s, Toyota researched production of an adiabatic ceramic engine with an operating temperature of over 6000 °F (3300 °C). Ceramic engines do not require a cooling system and hence allow a major weight reduction and therefore greater fuel efficiency. In a conventional metallic engine, much of the energy released from the fuel must be dissipated as waste heat in order to prevent a meltdown of the metallic parts. Work is also being done in developing ceramic parts for gas turbine engines. Turbine engines made with ceramics could operate more efficiently, giving aircraft greater range and payload for a set amount of fuel. Such engines are not in production, however, because the manufacturing of ceramic parts in the sufficient precision and durability is difficult and costly. Processing methods often result in a wide distribution of microscopic flaws that frequently play a detrimental role in the sintering process, resulting in the proliferation of cracks, and ultimate mechanical failure. Glass-ceramics are used to make cookware (originally known by the brand name CorningWare) and stovetops that have both high resistance to thermal shock and extremely low permeability to liquids. The negative coefficient of thermal expansion of the crystalline ceramic phase can be balanced with the positive coefficient of the glassy phase. At a certain point (~70% crystalline) the glass-ceramic has a net coefficient of thermal expansion close to zero. This type of glass-ceramic exhibits excellent mechanical properties and can sustain repeated and quick temperature changes up to 1000 °C. The individual wood pulp fibers in this sample are around 10 µm in diameter. Wood-based materials are also extensively used for packaging (e.g. cardboard) and paper, which are both created from the refined pulp. The chemical pulping processes use a combination of high temperature and alkaline (kraft) or acidic (sulfite) chemicals to break the chemical bonds of the lignin before burning it out. STM image of self-assembled supramolecular chains of the organic semiconductor quinacridone on graphite. 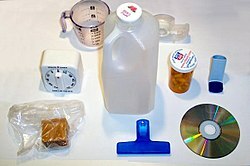 Household items made of various kinds of plastic. People have been using natural organic polymers for centuries in the form of waxes and shellac, which is classified as a thermoplastic polymer. A plant polymer named cellulose provided the tensile strength for natural fibers and ropes, and by the early 19th century natural rubber was in widespread use. Polymers are the raw materials (the resins) used to make what are commonly called plastics. Plastics are the final product, created after one or more polymers or additives have been added to a resin during processing, which is then shaped into a final form. Polymers that have been around, and that are in current widespread use, include carbon-based polyethylene, polypropylene, polyvinyl chloride, polystyrene, nylons, polyesters, acrylics, polyurethane, and polycarbonates, and silicon-based silicones. Plastics are generally classified as "commodity", "specialty" and "engineering" plastics. Applications of composite materials range from structural elements such as steel-reinforced concrete, to the thermally insulative tiles that play a key and integral role in NASA's Space Shuttle thermal protection system, which is used to protect the surface of the shuttle from the heat of re-entry into the Earth's atmosphere. One example is Reinforced Carbon-Carbon (RCC), the light gray material that withstands reentry temperatures up to 1510 °C (2750 °F) and protects the nose cap and leading edges of Space Shuttle's wings. RCC is a laminated composite material made from graphite rayon cloth and impregnated with a phenolic resin. After curing at high temperature in an autoclave, the laminate is pyrolized to convert the resin to carbon, impregnated with furfural alcohol in a vacuum chamber, and cured/pyrolized to convert the furfural alcohol to carbon. In order to provide oxidation resistance for reuse capability, the outer layers of the RCC are converted to silicon carbide. Semiconductor chip on crystalline silicon substrate. Many traditional solids exhibit different properties when they shrink to nanometer sizes. For example, nanoparticles of usually yellow gold and gray silicon are red in color; gold nanoparticles melt at much lower temperatures (~300 °C for 2.5 nm size) than the gold slabs (1064 °C); and metallic nanowires are much stronger than the corresponding bulk metals. The high surface area of nanoparticles makes them extremely attractive for certain applications in the field of energy. For example, platinum metals may provide improvements as automotive fuel catalysts, as well as proton exchange membrane (PEM) fuel cells. Also, ceramic oxides (or cermets) of lanthanum, cerium, manganese and nickel are now being developed as solid oxide fuel cells (SOFC). Lithium, lithium-titanate and tantalum nanoparticles are being applied in lithium ion batteries. Silicon nanoparticles have been shown to dramatically expand the storage capacity of lithium ion batteries during the expansion/contraction cycle. Silicon nanowires cycle without significant degradation and present the potential for use in batteries with greatly expanded storage times. Silicon nanoparticles are also being used in new forms of solar energy cells. Thin film deposition of silicon quantum dots on the polycrystalline silicon substrate of a photovoltaic (solar) cell increases voltage output as much as 60% by fluorescing the incoming light prior to capture. Here again, surface area of the nanoparticles (and thin films) plays a critical role in maximizing the amount of absorbed radiation. Physical properties of elements and compounds that provide conclusive evidence of chemical composition include odor, color, volume, density (mass per unit volume), melting point, boiling point, heat capacity, physical form and shape at room temperature (solid, liquid or gas; cubic, trigonal crystals, etc. ), hardness, porosity, index of refraction and many others. This section discusses some physical properties of materials in the solid state. 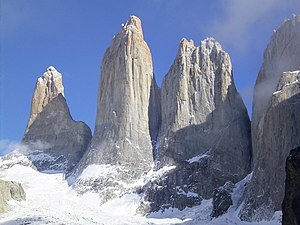 Granite rock formation in the Chilean Patagonia. Like most inorganic minerals formed by oxidation in the Earth's atmosphere, granite consists primarily of crystalline silica SiO2 and alumina Al2O3. Plasticity – Materials that behave elastically generally do so when the applied stress is less than a yield value. When the stress is greater than the yield stress, the material behaves plastically and does not return to its previous state. That is, irreversible plastic deformation (or viscous flow) occurs after yield that is permanent. Many materials become weaker at high temperatures. Materials that retain their strength at high temperatures, called refractory materials, are useful for many purposes. For example, glass-ceramics have become extremely useful for countertop cooking, as they exhibit excellent mechanical properties and can sustain repeated and quick temperature changes up to 1000 °C. In the aerospace industry, high performance materials used in the design of aircraft and/or spacecraft exteriors must have a high resistance to thermal shock. Thus, synthetic fibers spun out of organic polymers and polymer/ceramic/metal composite materials and fiber-reinforced polymers are now being designed with this purpose in mind. Normal modes of atomic vibration in a crystalline solid. Many materials also exhibit superconductivity at low temperatures; they include metallic elements such as tin and aluminium, various metallic alloys, some heavily doped semiconductors, and certain ceramics. The electrical resistivity of most electrical (metallic) conductors generally decreases gradually as the temperature is lowered, but remains finite. In a superconductor, however, the resistance drops abruptly to zero when the material is cooled below its critical temperature. An electric current flowing in a loop of superconducting wire can persist indefinitely with no power source. A dielectric, or electrical insulator, is a substance that is highly resistant to the flow of electric current. A dielectric, such as plastic, tends to concentrate an applied electric field within itself, which property is used in capacitors. A capacitor is an electrical device that can store energy in the electric field between a pair of closely spaced conductors (called 'plates'). When voltage is applied to the capacitor, electric charges of equal magnitude, but opposite polarity, build up on each plate. Capacitors are used in electrical circuits as energy-storage devices, as well as in electronic filters to differentiate between high-frequency and low-frequency signals. For some purposes, both the optical and mechanical properties of a material can be of interest. For example, the sensors on an infrared homing ("heat-seeking") missile must be protected by a cover that is transparent to infrared radiation. The current material of choice for high-speed infrared-guided missile domes is single-crystal sapphire. The optical transmission of sapphire does not actually extend to cover the entire mid-infrared range (3–5 µm), but starts to drop off at wavelengths greater than approximately 4.5 µm at room temperature. While the strength of sapphire is better than that of other available mid-range infrared dome materials at room temperature, it weakens above 600 °C. A long-standing trade-off exists between optical bandpass and mechanical durability; new materials such as transparent ceramics or optical nanocomposites may provide improved performance. All solar cells require a light absorbing material contained within the cell structure to absorb photons and generate electrons via the photovoltaic effect. The materials used in solar cells tend to have the property of preferentially absorbing the wavelengths of solar light that reach the earth surface. Some solar cells are optimized for light absorption beyond Earth's atmosphere, as well. ^ Holley, Dennis (2017-05-31). GENERAL BIOLOGY I: Molecules, Cells and Genes. Dog Ear Publishing. ISBN 9781457552748. ^ Rogers, Ben; Adams, Jesse; Pennathur, Sumita (2014-10-28). Nanotechnology: Understanding Small Systems, Third Edition. CRC Press. ISBN 9781482211726. ^ Nahum, Alan M.; Melvin, John W. (2013-03-09). Accidental Injury: Biomechanics and Prevention. Springer Science & Business Media. ISBN 9781475722642. ^ Narula, G. K.; Narula, K. S.; Gupta, V. K. (1989). Materials Science. Tata McGraw-Hill Education. ISBN 9780074517963. 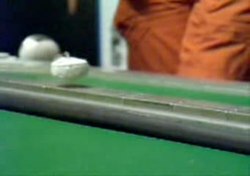 ^ Arnold, Brian (2006-07-01). Science Foundation. Letts and Lonsdale. ISBN 9781843156567. ^ Group, Diagram (2009-01-01). The Facts on File Chemistry Handbook. Infobase Publishing. ISBN 9781438109558. ^ Mortimer, Charles E. (1975). Chemistry: A Conceptual Approach (3rd ed.). New York:: D. Van Nostrad Company. ISBN 0-442-25545-4. ^ Bar-Cohen, Yoseph; Zacny, Kris (2009-08-04). Drilling in Extreme Environments: Penetration and Sampling on Earth and other Planets. John Wiley & Sons. ISBN 9783527626632. ^ "Ceramics". autocww.colorado.edu. Retrieved 2017-05-09. ^ Walter H. Kohl (1995). Handbook of materials and techniques for vacuum devices. Springer. pp. 164–167. ISBN 1-56396-387-6. ^ Shpak, Anatoly P.; Kotrechko, Sergiy O.; Mazilova, Tatjana I; Mikhailovskij, Igor M (2009). "Inherent tensile strength of molybdenum nanocrystals". Science and Technology of Advanced Materials. 10 (4): 045004. Bibcode:2009STAdM..10d5004S. doi:10.1088/1468-6996/10/4/045004. PMC 5090266. PMID 27877304.